Ainslie Waldron: an Author to Know! "One of Australia's 25 Most Intriguing" takes your calls on business and how to succeed in six months! Ainslie Waldron, one of the world's smartest women and author of The Ultimate Secret for Business, joined us to let us in on some easy ways to improve your business and your bottom line. For more information, visit Ainslie's website. Interview with business author Ainslie Waldron while she was here in the States on a book tour. This week is all about different perspectives on the still limping but soon to recover economy; the mood is captured pretty accurately in the title of this week’s Policy Matters column: Half Empty, Half Full. 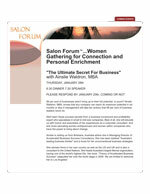 "The Ultimate Secret For Business"
99 per cent of businesses aren't living up to their full potential. Is yours? Ainslie Waldron, MBA, knows that any company can reach its maximum potential in six months or less if management will take ten actions that 99 per cent of business leaders never do. 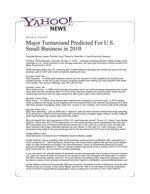 Small business will lead it, says Ainslie Waldron 'They'll be the ones that will pull us out of this gloomy economy' Small businesses will dig America out of the Great Recession thanks to four trends now developing, says small business consultant Ainslie Waldron. Portland, OR & Brisbane, Australia January 11, 2010 -- Australia's leading business thinker brings a new message to U.S. small business on her January book tour: the new Lean Economy is fertile ground for A Major Turnaround in 2010. PORTLAND, Ore., March 19 /PRNewswire/ -- Recession Tuning a business isn't slashing expenses, freezing hiring and ravaging your marketing budget; in fact these actions can doom your company unless you add a positive balancing element to each. Australia's leading business thinker offers three Tips to Recession Tune any business for immediate profits.